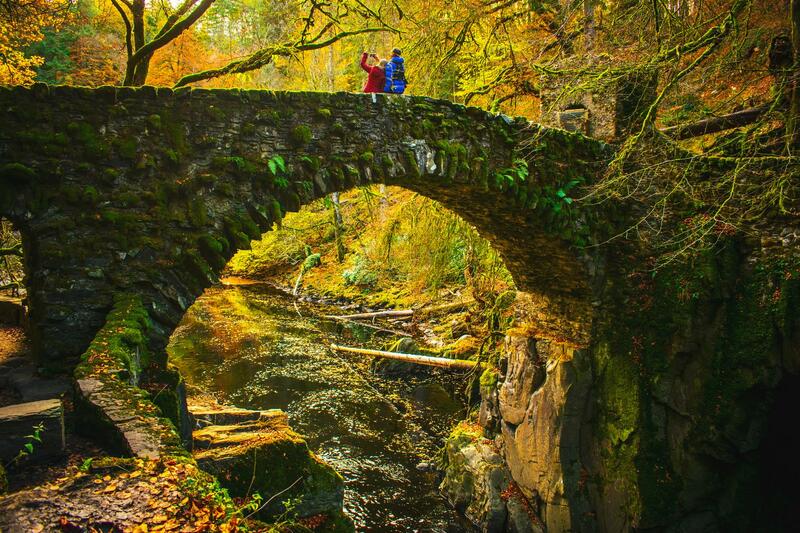 Walk across Scotland through ever-changing landscapes. Enjoy a fireside dram at the end of an unforgettable day. Spot Ben Nevis, which marks the end of your Coast to Coast. 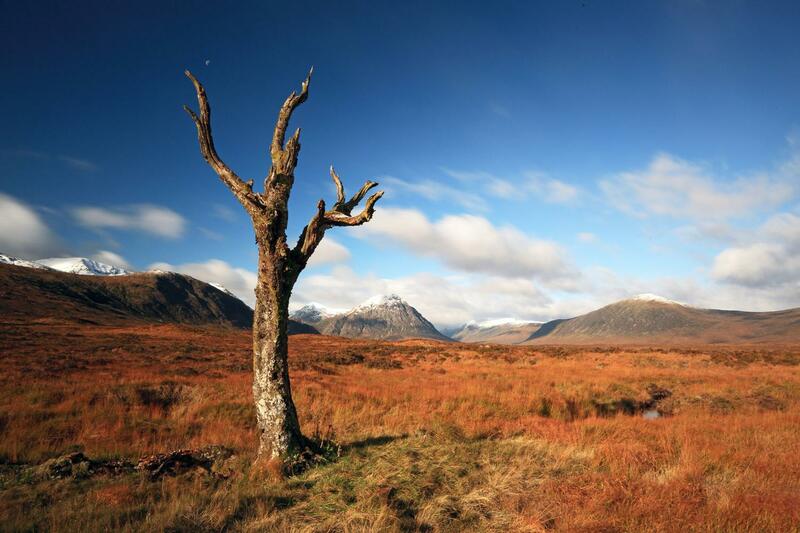 Traverse the incomparable Rannoch Moor. Tuck into a perfectly prepared meal at remote Highland hotels. Traverse Scotland from Coast to Coast on foot. Take on a classic journey from Perth to Fort William across the moors, mountains and rivers of the central Scottish Highlands. 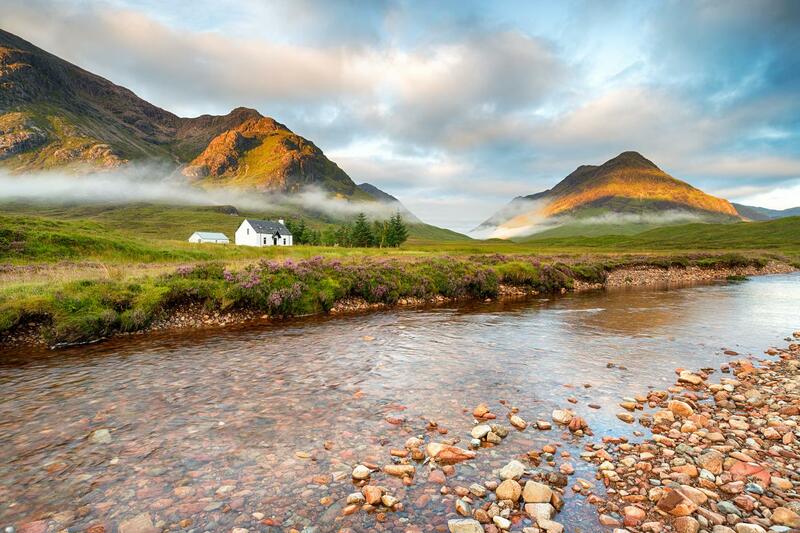 The Scottish Coast to Coast walk visits charming highland towns, remote hotels, quiet glens and wide open moors. All touched by history, people and stories. The Scottish Coast to Coast Walk starts in the elegant city of Perth and follows the River Tay to Dunkeld and Aberfeldy. The route meanders to Kenmore before heading into the empty, and majestic, countryside of Fortingall, Kinloch Rannoch, Rannoch Station and Kingshouse. 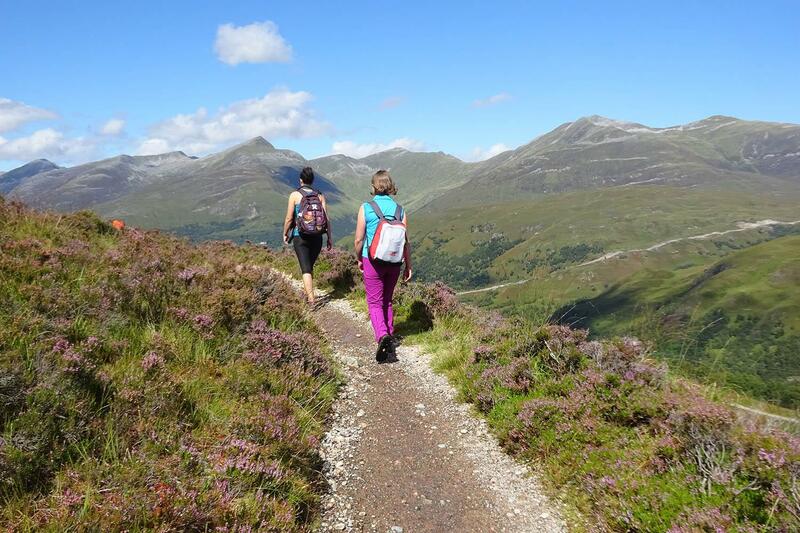 At Kingshouse you join the West Highland Way to Kinlochleven and then Fort William, the end of your Scottish Coast to Coast Walk. 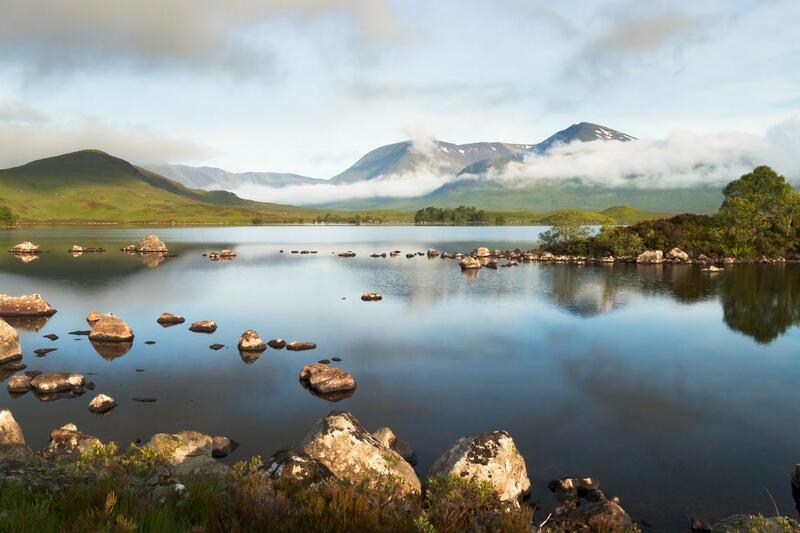 Whilst the incomparable scenery of the Scottish Highlands is the number one draw there are numerous other points of interest to explore on your journey across Scotland; prehistoric settlements, medieval churches, beautiful cathedrals, restored Crannogs, ancient clan battlefields and more. But the walking is only half the story. On your coast to coast journey you will also discover delicious locally sourced salmon, smokey whiskies, charming highland hotels and the warmest of welcomes. Download an elevation profile chart for this walk. 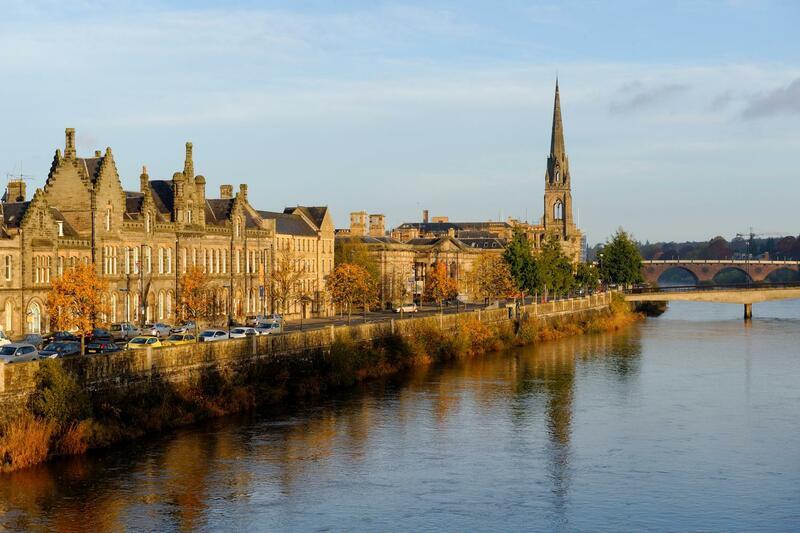 Perth is an elegant town of almost 50000 sited on the banks of the River Tay at the head of the Forth of Tay and the jumping off point for your coast to coast walk. Perth is easily accessible by road, rail and car from Glasgow and Edinburgh (1h20) or further afield. Settle into your accommodation, take a stroll or visit St John’s Kirk. After collecting a pebble from the banks of the River Tay you head north along the banks of the Tay to Luncarty and Stanley. The Tay is the longest river in Scotland and you will get to know it well over the next few days. Following a very quiet county road you quickly leave Bankfoot behind and climb gently alongside Garry Burn to Glen Garr. You may be tempted to climb the Obney Hills to visit either the obelix or prehistoric fort, which mark their summits. Continue to Dunkeld via the Rumbling Bridge and Hermitage. The Hermitage has long been a stopping point on the grand Scottish Tour. The mature forests, streams and waterfalls make for a delightful end to a pleasant day. Dunkeld and Birnam straddle the River Tay and much of the townscape has been restored by Historic Scotland, making it one of Scotland’s prettiest towns. Dunkeld Cathedral is a particular highlight. Today your Coast to Coast moves up a notch with a tough day over the moors and through forests to Aberfeldy. You start by following the old military road to Ballinloan and then climb over Grandtully Hill to Aberfeldy. The excellent cakes at the Watermill cafe in Aberfeldy should only be skipped in emergency! The Birks of Aberfeldy are the first of many highlights on an action packed day to Fortingall. Following footpaths and farm roads you soon reach Kenmore at the head of Loch Tay. 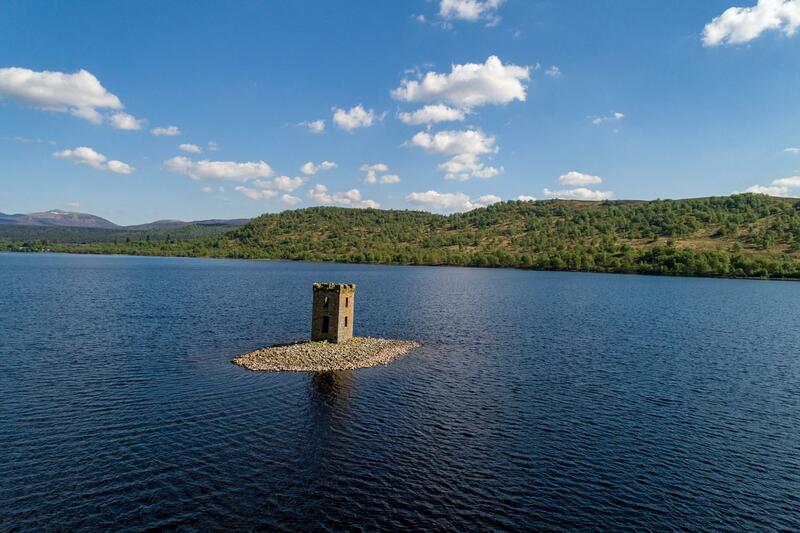 History buffs shouldn’t miss the Scottish Crannog centre or alternatoivey the Kenmore Hotel, one of many claimants to the title of Scotland’s oldest inn. Leaving Kenmore the route climbs over Drummond Hill, rewarding with expansive views of Loch Tay. The hamlet of Fortingall is famous for having the oldest tree in Scotland and is reputedly the birth place of Pontius Pilate - the son of a Roman Legionary and a local girl. Get ready for a wonderful day of classic Scottish hillwalking through an empty corner of the highlands. You follow a rough track to Glenmore Bothy, with the iconic shape of Schiehallion looming ahead. A ruined highland village lies at its feet. Once you climb over the shoulder of Schiehallion it is all downhill to the Kinloch Rannoch. The path is indistinct and very rough/boggy in sections, but the scenery more than makes up for it. The empty highland landscape and dark waters of Loch Rannoch are your only companions as you walk to the remote Rannoch Station. You follow the small almost completely traffic free road on the southern shore of Loch Rannoch for most of the day, although some small off road diversions are possible. The emptiness of Rannoch Moor is beguiling. A big sky landscape of marsh, rivers, lochs and bogs populated only by deer. Your walk follows an ancient right of way which cunningly finds a route through this empty, but beautiful, landscape. Kingshouse Hotel, sitting picture perfect in front of Buachaille Etive Mor marks the end of your day’s walk. Summer 2017: Kingshouse Hotel is closing for refurbishment from October 2016 for approx. 18 months, and a transfer from Kingshouse to nearby accommodation (returning to Kingshouse the next day) will be provided. 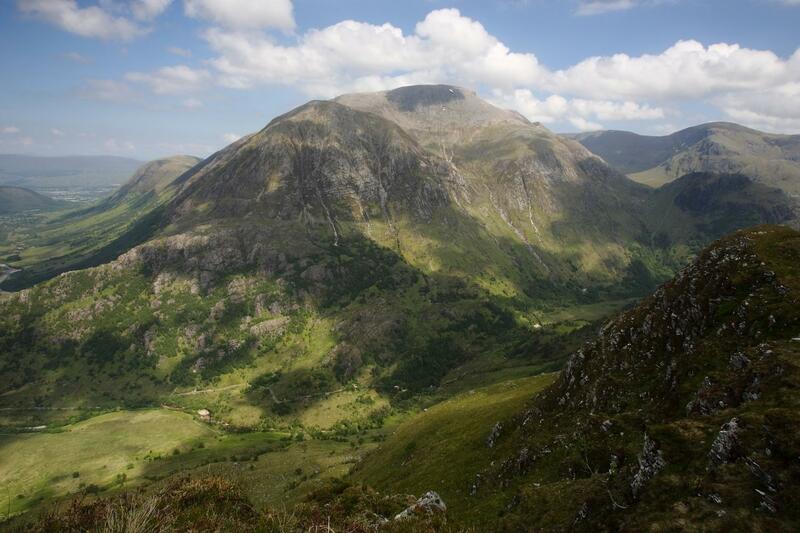 Joining the West Highland Way you are soon climbing the Devil’s Staircase at the head of Glencoe. 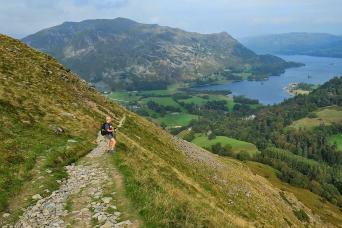 A short sharp climb rewards with 360 degree views of the peaks of the western highlands. Kinlochleven sits winking at you from the valley far below and you will be enjoying a drink before you know it. All that remains is a final push to the west coast at Fort William. Reflect on a coast to coast journey of contrasts as you walk through the remote Lairigmor pass towards Ben Nevis. Scotland’s highest mountain, which marks the end of your coast to coast epic. Well done! 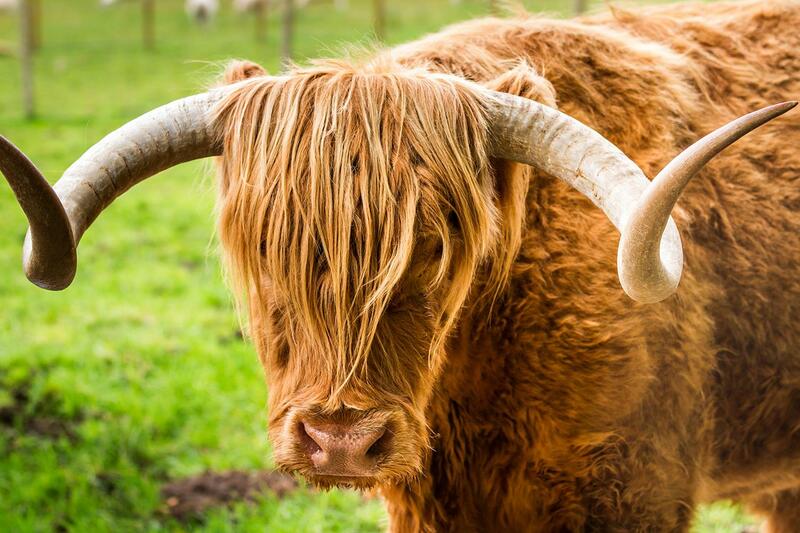 Continue your adventure in the Highlands or return to Glasgow by train (4hrs) or bus (3hrs). We specifically choose each nights’ hotel, inn, guesthouse and B&B to ensure that you enjoy every minute of your stay. They all offer a warm welcome to walkers, traditional hospitality and delicious local food. They range from remote highland inns with a history dating back hundreds of years to charming family run B&B’s. We aim to use three star accommodation as a minimum but some remote inns are either not graded or only two star. Each night offers something different. Due the remote nature of this trip, it is not available for solo walkers. However, if you require single rooms these are available, although a single supplement is payable. Single rooms in remote inns or small B&B’s may not have en-suite bathrooms. A delicious breakfast is included each morning. Most accommodation offers a full Scottish Breakfast as well as a continental option. You won’t start the day hungry! Lunch and dinner are not included so you are free to choose from the available options. Most of your accommodations will more than happy to provide a packed lunch on request and this can be booked on arrival. Dinner is available either at your accommodation or nearby pubs and restaurants. The Scottish Coast to Coast Walk is available from the end of March to October. You can start your walk on any day of the week, with the exception of Sundays, during the season. Your bags will be transferred from your accommodation as per your itinerary. We ask you to limit your luggage to one bag of up to 20kg per person. Your information pack has a detailed equipment list which includes standard walking gear such as good walking boots or shoes, warm and waterproof clothes and a day pack. Unfortunately we are unable to accommodate walkers with dogs as many of the accommodation providers do not accept pets. This route is not way marked |(with the exception of the last two stages, which are on the West Highland Way), and a few sections follow very indistinct trails. You should be a competent navigator with map and compass. The route comprises of hill and mountain tracks, riverside trails, minor roads and highland paths, some of which can be indistinct and boggy. We can provide GPX tracks as a guideline for this walk. Download an elevation profile chart for this walk. You may wish to extend your time on the Scottish Coast to Coast and we can add extra nights at any point before, during or after the walk. 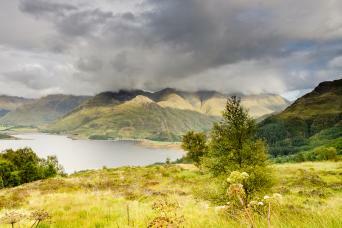 Kinloch Rannoch and Fort William are popular options. 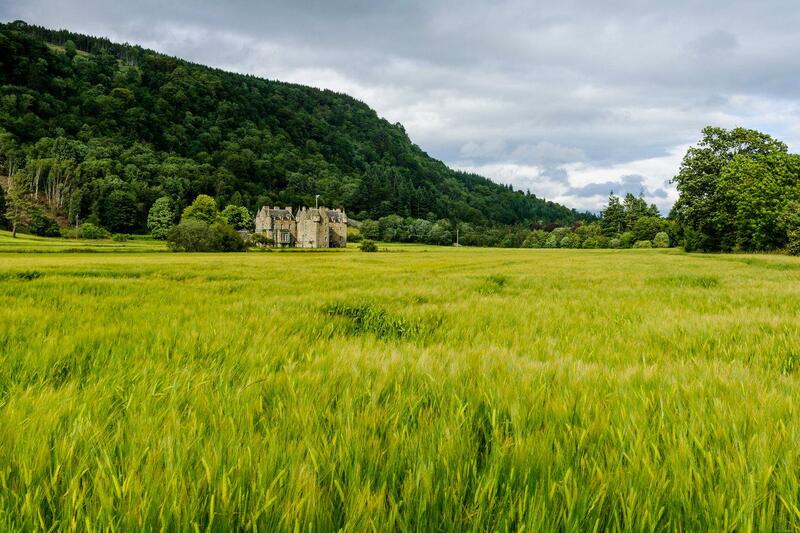 Taking a rest day in Aberfeldy allows you visit Castle Menzies, enjoy a Land Rover Safari or even white water rafting on the Tay. This trip is not available to solo walkers for safety reasons. Perth is a major transport hub and easily accessible from Glasgow and Edinburgh by road, rail or coach. The train from Glasgow takes 1h20 and 1h15 from Edinburgh. Regular trains (3 per day) and buses (4+ per day) run from Fort William to Glasgow. The journey takes 3 hours by bus and 4 by train, although the train is more scenic. Visit www.travelinescotland.com to plan your journey by public transport. Hand picked accommodation in country hotels, inns and B&B’s. A detailed info pack, route notes and map for each party. We are often asked the following questions and I hope that you will find the answers useful. Give us a shout if you have any further queries. The daily distances are up to 17 miles and the trip is graded moderate to strenuous so you should have a good level of walking fitness as you will be walking for up to 8 hours each day. If you currently don’t enjoy that level of fitness regular walking in hilly terrain supplemented by cardio vascular exercise for at least 6 months prior to your walk is recommended. A good gym or personal trainer will be able to draw up a personalised training programme. We suggest you book as soon as your plans are finalised as the Highlands are very popular especially in May and the summer. Traditionally April/May has always been the most popular time of year for walking in Scotland because the theory goes that the weather is better and the midges have not yet appeared. Although having walked in the highlands extensively I believe that any time from late March to October offers a wonderful experience. We would do this again. Our contact, Cara, did a fabulous job booking our accommodations. She was also flexible when we asked for extra days here and there for various reasons. My wife and I are closing in on our 70th year so saw the C2C as a challenge through, what we knew, would be rugged but spectacular countryside. Our expectations, in all aspects, were not only met but exceeded. The organization by MacsAdventure and their quick response to questions was first rate - thanks to Cara McCauley and Kayleigh Morrison. Our accommodations were generally very good with six of the nine being exceptional. Had we been more familiar with three or four of the destinations, we would have happily stayed two nights instead of one - (next time). The food at the various B&B's was, again, very good with five of the nine being phenomenal. An added bonus of the C2C was the warmth and charm of the Scottish people we met, along with the music and the whiskey after a long day on the trail. Would we go again?? - in a heart beat! The hotel manager at our hotel in Dunkeld was super helpful: he gave us a ride, printed out a PDF file with hiking notes, and gave us a plastic cover to protect the notes from the incessant rain. A Great and Challenging Walk! We are both fairly experienced 'walkers' but this was the first 'unwaymarked' (if that is a word?) walk that we have attempted. It was an issue I guess as use of a map, compass and strict adherence to the instructions were essential but we knew this prior to setting off. Anyway, fantastic scenery, amazing weather, not just for Scotland but for anywhere and at times a real challenge which was all that we were looking for. Thoroughly enjoyed it and the arrangements made by Macs were perfect as usual; from pre journey information, maps, accommodation, baggage, taxi at the Kingshouse all were excellently handled and communicated. Have used Macs before and would have absolutely no hesitation in using Macs again - in fact, have just done so. Few points to raise, as I said, the accommodation was great, particular mention to Scott and Steph' at the hotel in Rannoch Station, nice people, great hotel, great food. Appreciate that at Kinloch Rannoch, accommodation is limited but the Macdonald Hotel, whilst fine is a tired looking old place but did the job fine on cup final day. The Tailrace in at Kinlochleven has gone downhill a bit too but for one night never an issue. The walk itself was hot and challenging, particularly those parts where the trail ends and one is left to get through heather and bog over Rannoch Moor and between Fortingall and Kinloch Rannoch, beautiful, stunning and tough going. I know that it is completely out of anyone's hands but the part through Griffin Wind farm between Dunkeld and Aberfeldy is just simply, not very nice and the path through it isn't clear at all. Not sure what can be done about it, I suppose it's just getting through that part, being 28 degrees that day I guess didn't help too much either. Overall, was a great walk, in great weather and thoroughly enjoyed the experience and thanks again to Macs for the outstanding service. We'll be back. Our Scottish Coast to Coast walk was a wonderful and unforgettable experience - Macs Adventure did a great job with the organisation. The accommodations were very good, great B&Bs! The stages of the tour are very interesting, some parts are real highlights - crossing Rannoch Moor for example was marvellous. The route notes were very helpful and nearly perfect, but GPS is a must-have! We also had really good food everywhere, and there is absolutely no problem for vegetarians! Very good Info pack before the trip. Very helpfull staff, professionel company. Bring a GPS, as The written material Can seem like a lot to take in, and a few typing errors made it confusing. Would be Nice if this had Been waterproof. Would love if single rooms were less expensive, as some of them were not up to standard. I'd give this trip 4.5 stars. The route allowed us to combine two of the things we want most on a hike: solitude and spectacular scenery. The early sections - pretty but not spectacular - we had almost entirely to ourselves. 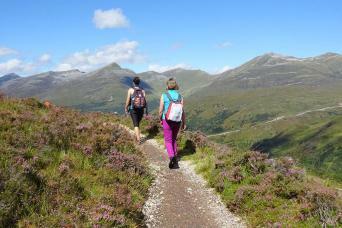 The later sections, especially on the West Highland Way, were spectacular but also crowded. We geocached along the route as well as walking. Highlights: Craigvinian Forest, the tire swing in Weem Wood, walking along the shoulder of Schiehallion, veggie dinner at Moor of Rannoch, Rannoch Moor itself, the side trip to a hillfort site with jawdropping views of Ben Nevis. Also, when a group member got sick, a proprietor of the Bankfoot Inn was kind enough to give us a lift to the next town. The friendly dog at the Pend was a favorite (and we're cat people). Not so nice: we had to ignore lots of "no unauthorized persons" signs to get through the active logging zone outside Aberfeldy. Route notes were sometimes just wrong or incomplete, though common sense and occasional reference to GPS kept us mostly on track. It would be helpful if the notes mentioned services like public toilets and places to do laundry. Overall, this was a great trip. I'd recommend it to anyone who is reasonably fit and has some experience with routefinding. You need to do your homework in advance. We used an interactive topographic map and Google Maps to follow the daily routes. As we started each hike it was like meeting an old friend. We added two days in Edinburgh to the start and one day in Glasgow to finish. Our hotels and travel links were all done in advance over the internet and went without a problem. The rest of the trip Mac did to perfection. We picked July because of the best weather opportunities but you have to prepared for the weather to change. A good rain suit and a foldable umbrella take care of those minor issues. Above all else you have to stop walking and drink in the scenery. We loved everything about our coast to coast adventure! This was our first time in Scotland and I could not think of a better way to really see the country. We enjoyed the solitude of the first part of the walk and the chance to meet fellow walkers on the West Highland Way portion. The accommodations were great! We are both vegetarians and found plenty to eat on the route, even in some of the more remote spots. Some of our highlights include Glen Garr, The Hermitage and Rannoch Moor. We had to turn back on our hike to Kinloch Rannoch because of poor visibility but the destination hotel had a pool, steam room and sauna. A great break in the middle of the trip. Can't wait to book our next trip! This is a fairly tough walk through some very remote areas so is best suited to more experienced walkers who can navigate using map and compass. They will be rewarded with an unforgettable walk!